I’d venture that well-sinking isn’t something most of us think too much about these days. In the pioneering days ensuring that your farm had sufficient water was critical to survival. With no piped water for humans or stock, buying a block near running water like a creek (but not too close because of floods), was often a key consideration. Alternatively you might have to build a dam or a well. Trove stories reveal that accidents to well-sinkers were frequent and often fatal. 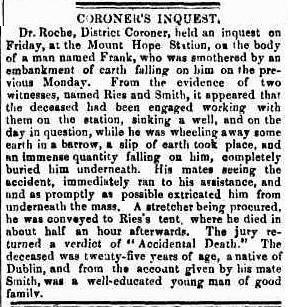 Thanks to the indexes of the Toowoomba and Darling Downs Family History Society many years ago I found the story of the death of young Peter Conroy which I mentioned recently in my MI post. Of course these days it’s easier to find the same story via Trove. The newspapers in those days tended to graphic prose with all the gory details so I read how Peter’s brains were hanging out and his bones broken when the jumper they were using faulted. Stephen Gavin was able to get his leg into the bucket so that he could be pulled up to the surface when help arrived. Peter died of his injuries but Stephen survived though his health was affected. Importantly, the newspaper story, and a nearly illegible inscription on the grave shared with the Gavin family, are the only traces of his death. Peter’s burial does not appear in the Drayton cemetery burial registers which commence later than his death, nor can I find his death indexed in the Qld BDMs. Without the work of TDDFHS, and later Trove, this man’s life in Australia would have gone completely unremarked. 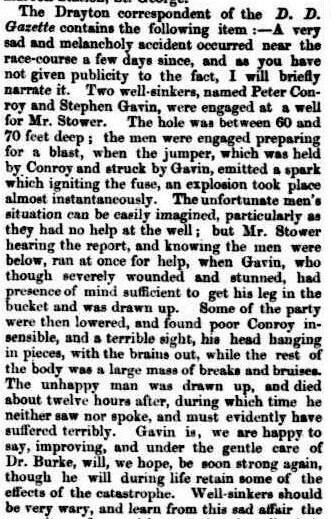 Peter Conroy is not the only man to lose his life in this way and a quick search of Trove brings up other fatalities from well-sinking. This entry was posted in Family History, Gavin Family Queensland, Trove Tuesday and tagged Frank, Peter Conroy, Ries, Stephen Gavin, Trove Tuesday, well sinking by cassmob. Bookmark the permalink. Whew, what a terrible accident! Some things were really dangerous in the old days. Sure were Sheryl…we tend to forget how much so I think. A great find, Pauleen. After reading your summary, I decided not to read the article itself, but I’m sure it’s very descriptive!